Just finished this guy up this week as part of a bigger commission. Nothing fancy, the paint scheme matches the way the rest of the force was painted (it's not my current dark method). 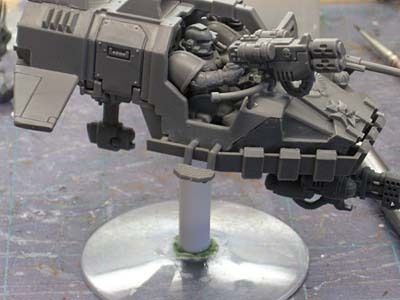 I've got another one (land speeder) coming up for a DIY Chapter. It's been a nice change of pace to paint up these models instead of painting another Space Hulk Terminator or building yet another Bloodthirster. I've still got to add the grass to the base but I won't do that until after it's been varnished. 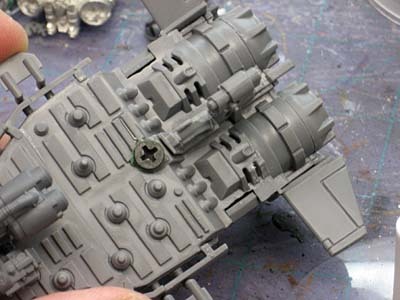 I did take the time and magnetise the model to it's stand. A fairly easy process and it helps with transporting. Besides, the flying stands they give us just doesn't hold up to the rigors of game play. 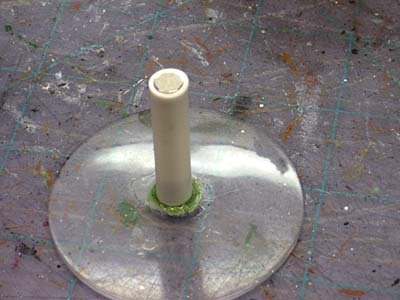 The tutorial for magnetizing can be found here. Here are a couple shots of the process as it relates to land speeders. Drilling the hole for the screw and then flaring out the opening so I can sink the screw head down into the body of the speeder. Remember to use a flat faced screw and not a rounded one! Ready to go on its new base. Another elegant flying stand mag-mod. Another thing I'd like to try but haven't had the need. 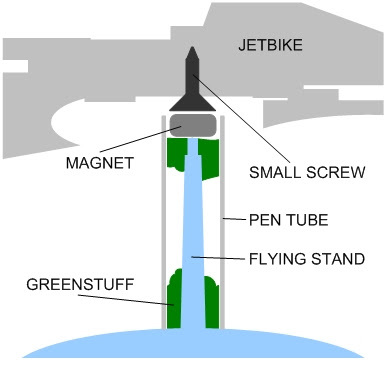 Place the magnet on it's side with half of it sticking out of the flight stand. 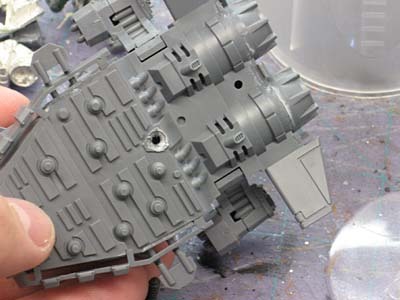 Then when you place the model on it's magnet, the half of the magnet sticking up goes in the groove in the screw. In theory this would prevent spinning on it's base as well. I have magnets that fit into #6 screws perfectly this way, and the hold is pretty decent as the magnet is surrounded by metal. I just haven't had a project to try it on yet. I've started using bases from www.back2base-ix.com which have been successful for me. They have different types of stands depending on the vehicle your putting it on. Here is a link to one I have painted up already. 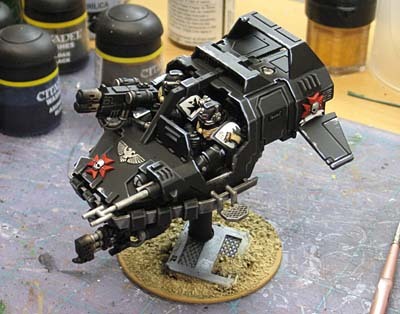 The good thing about them is that they sell in a batch of 4-8 so for my gun drones that attach to my Devilfish I can have them for easy addition to be removed. WOW what a simple yet great idea...nice work on base and lander!